From birds I will move to cats as I have now acquired a little cat who I found nearby a few weeks ago with a very badly injured leg. I took her to the vets where sadly she had to have her leg amputated. She seemed to have been a stray for some time and so I have taken her in. 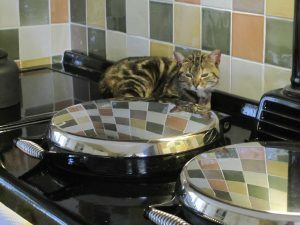 As you can she she is making herself at home and fortunately is getting on well with Wattie. 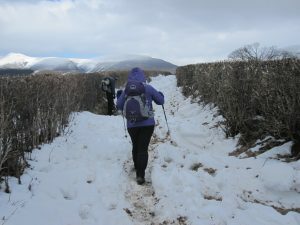 There are still small patches of snow on the fells and the snow that fell earlier in the year remained on the higher fells for a long time as the temperatures remained below freezing. The snow in the middle of March created a lot of drifting in surprising places and the road between Loweswater and Lorton was blocked for a little while until one of the farmers came along with a digger! The picture below is of the road towards Castlerigg Stone Circle a week after the snowfall! It has been very beautiful with snow on the fells for so long and when there were blue skies as well, it was glorious to be out. 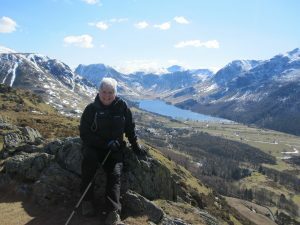 Below is a picture of my friend Lynn on Rannerdale Knotts on a ‘good to be alive’ day!